A couple of weeks ago we had a 'Ladies Tea' at our church. It was a great time of fellowship with lots of great food. 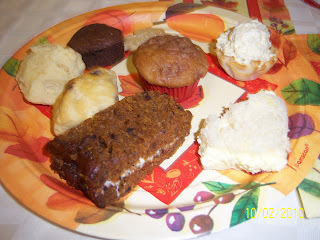 The picture below is just a portion of what was available and it was all delicious. See the little mini tart in the upper right-hand corner? That was my absolute favorite! Everyones favorite! It was a pastry shell filled with the best chicken salad EVER. I am going to hunt down the recipe and hopefully share it here. You will love it! The 'Tea' was actually a kick-off for the annual Operation Christmas Child event through Samaritans Purse. Those who wish to participate fill a shoebox with items for a young boy or girl. Choose an age group, follow a list of recommend and restricted items, write a note or enclose a picture if you'd like, label it and send it off. After we finished with our meal, it was time for the guest speaker. A beautiful young lady named Oksana Nelson. Oksana was an orphan in Russia until the age of ten. She spoke of her life there... She told how all of the kids in the orphanage had to share the same toothbrush. They didn't have one of their own. She told how they could only take a bath every other week and when they did... they had to boil and carry water from next door that would most often be frozen on top before they got it into the tub. A place so dark and void of love that none of them had any hope for their future. That is until some missionaries came and delivered shoeboxes filled with gifts for each of them. For the first time, Oksana had something that was her own. She had her own toothbrush. Doesn't seem like a big thing to us... but to a child who has nothing, it means the world to them. For once in her life, Oksana felt that she was loved and that she had a future. If you would like to get involved and send a Christmas shoebox of your own, please visit Operation Christmas Child for more information. This is a great way to give hope to a child. I encourage you to get involved today. If you'd like to learn more... please watch this promotional video from Operation Christmas Child from Samaritan's Purse. It's just a few minutes... but it can make a lifetime of a difference.